The Megalithic Passage Tomb at Newgrange was built circa 3200 BC. The kidney shaped mound covers an area of approx one acre and is surrounded by 97 kerbstones, some of which are richly decorated with megalithic art. The 19 metre long inner passage leads to a cross-shaped chamber with a corbelled roof. It is estimated that the construction of the Passage Tomb at Newgrange would have taken a work force of 300 at least 20 years. Newgrange has been designated a World Heritage Site by UNESCO and is a hugely popular and important Irish Heritage Site. 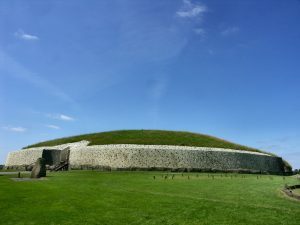 There is no direct access to the Passage Tomb at Newgrange; access is by guided tour from the Brú na Bóinne Visitor Centre located close to the village of Donore, Co. Meath. 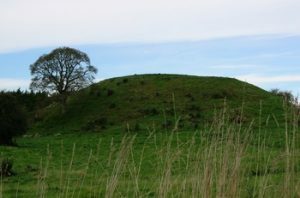 The Great Mound at Knowth was built over 5000 years ago, probably after the construction of Newgrange and before the construction of Dowth. 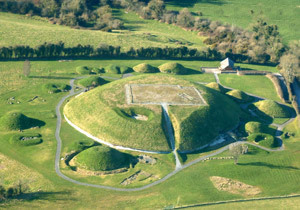 Knowth is similar in size to Newgrange and is surrounded by 18 smaller satellite mounds. The Great Mound has two passages with entrances on opposite sides, the western passage is 34 metres long and the eastern passage is 40 metre long, ending with a cross-shaped chamber. Calendar Stone – a large kerbstone at Knowth indicates that the people who constructed the great mound were aware of the cycle the moon. Lunar Stone – a 5000-year-old stone device used to calculate the lengths of the lunar month, and the length of the year. Dowth the Fairy Mound of Darkness is about the same size as Newgrange and Knowth and was built in the same period over 5000 years ago. The Dowth South passage is only 3.5 metres in length with a simple circular chamber and a single recess to the right. Dowth South is aligned to the setting sun of the winter solstice; the setting sun illuminates the passage and chamber from about 2pm to 4pm on the days around the winter solstice.